Depending on your criteria, in Holland alone there were between 1000 and 1500 advertisement records made in the period between 1955 and 1975. Mainly 45’s, but there are a few LP’s and other formats. I know that in Germany there are even more advertisement records made in that period. Of other countries I have no information, but it seems that, although Germany and Holland were the most productive in this area, there must be many hours of interesting sounds pressed in advertisement records from other countries. I played some of the records before I moved them to my “for trade shelf” and as always, I immediately realised why I collect these records in the first place. More than any other records, advertisement records are objects . They are more than the sound that is on them. Of course the design is often great, but that is not all. It is the fact that advertisement records are snapsnots of the culture of that moment. Of course, every record captures the zeitgeist, even those who were intended to be timeless. But advertisement records conserve more of the time in which they were made than ordinary records. Even when they are from a time and country that are not mine, it feels like my record player changes a bit in a time machine when I play these records. I especially love flexi records. In the 60’s Nesquik, a powder that was sold under the name Cacao phantasy and that you had to mix with milk, made a series of records with imitators. Jean Valton, Tony Corsari and Claude Vega did imitations of artists that were famous in France in those days. I don’t know many of these artists, but Johnny Halliday hopefully rings a bell with some of the readers of this Soundtrack. I am not impressed by the quality of the imitations, as far as I can judge them, but the imitators sing original songs in the style of the artists. And all the songs are about Nesquik. 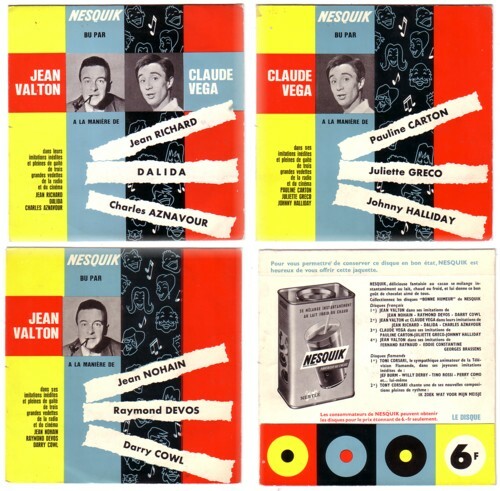 Here is Claude Vega doing his imitation of Johnny Halliday, and the Nesquik tune, sung by a lady who is not mentioned. Hallo, ik neem aan dat het stukje van Vega maar een deel van het plaatje is. Ik heb hier zopas dat van Toni Cosai beluisted waarop hij Jef Burm, Willy Drby, Tino Rossi en Perry Como imiteert en dat duurt veel langer. Ik vind e wel goed en brengt je direct terug naar die tijd! zijn dit plaatjes van Sonopresse? Kun je dat zien? Nu even niet, omdat de platen niet op volgorde staan wegens herinrichting van mijn kasten. Maar ik kom hier binnenkort op terug!